Larkyn Parry is pictured showing her Reserve Champion Fat Steer at the 2018 Highland County Fair. During the 2018 Highland County Fair the Hillsboro FFA had 11 members exhibit beef. Members participated in showmanship, skillathon and the open and junior shows. Those who exhibited were Heather Burba, Riley Burba, Lana Grover, Joe Helterbrand, Emma Parry, Larkyn Parry, Lawton Parry, Brennen Priest, Gavin Puckett, Griffin Puckett and Bryce Stanley. On Tuesday, Sept. 4, members participated in the beef showmanship contest. This contest is based on courtesy shown to the other showmen, how well the animal is presented and how knowledgeable the exhibitor is concerning their animal. This year Gavin Puckett won Overall Beef Showman and participated in the Showman of Showmen contest. The Jr. Fair Beef show was held on Thursday, Sept. 6. In the Beef Breeding show, member Heather Burba was awarded Grand Champion Gelbvieh Balancer Heifer and Reserve Champion Gelbvieh Balancer Heifer. Gavin Puckett was Champion High Maintainer Heifer. And Riley Burba was Grand Champion Gelbvieh Heifer. Following the breeding show was the feeder calf and fat steer show. During the feeder calf show, Lawton Parry was second in class. Lana Grover was also second in class. Grand Champion Feeder Calf went to Emma Parry. During the Fat Steer Show, Larkyn Parry was awarded Reserve Champion Fat Steer. Helterbrand, Gavin Puckett and Grover had seconds in class during the Fat Steer Show. Grover was also awarded Reserve Champion Rate of Gain with her fat steer averaging a daily gain of 2.64 lbs. 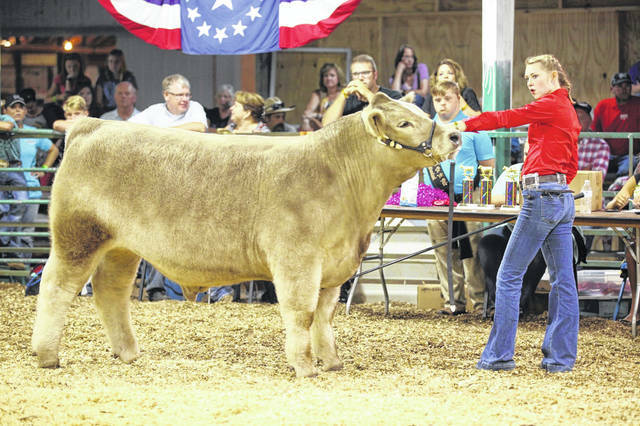 https://www.timesgazette.com/wp-content/uploads/sites/33/2018/09/web1_Beef-pic.jpgLarkyn Parry is pictured showing her Reserve Champion Fat Steer at the 2018 Highland County Fair.